Sidling up to the fuel dock at Miami Beach Marina is a fairly easy chore, unless you happen to be driving a great big motoryacht with a gorgeous dark-blue fiberglass hull, a displacement pushing 50 tons, and a price tag of approximately $3 million. 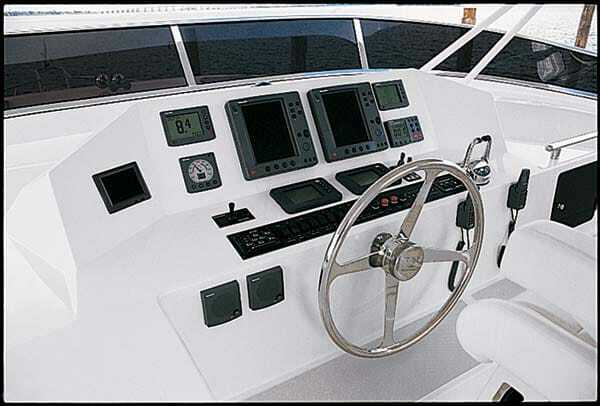 Of course, should these factors top your list of priorities on any given day, a host of rather exotic boat-handling considerations must be taken into account—stuff like the constraining distance between the outer breakwall and the two inner ones, the even more constraining distance between the two inner ones and the fuel dock itself, and the nerve-jangling effects of tide and current. Ordinarily, safely dealing with such details takes time—lots of it. Big boats usually move slowly while maneuvering in tight spots. 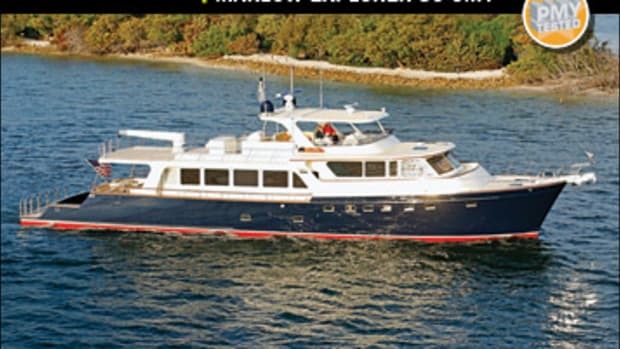 So when David Marlow and his Marlow Explorer 72 materialized in seeming moments right in front of the dockmaster&apos;s office that I was leaning against, I was stunned, and so was the fuel-dock attendant I&apos;d been talking with while waiting to get onboard. "Hey there, Bill," Marlow&apos;s voice boomed from the flying bridge, just as a gleaming quarterguard kissed a piling. A young fellow doing deckhand duty appeared at an access door in the bulwarks, lifted a wrist-thick oval handrail of stainless steel, and offered me a hand with my test gear. 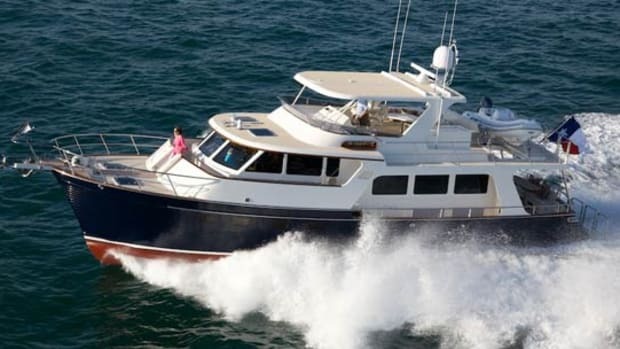 Other than a couple of short shots from the bow thruster, two more from the stern thruster, and the low background rumble of the mains, there was little else to announce the arrival of the big yacht. I stepped aboard, shouting an all-clear, then headed topside, venturing through the saloon at a good clip and bounding the stairway at an even better one, all in hopes of observing first-hand how Marlow maneuvered the boat with such lightning precision. I didn&apos;t quite make it, though. By the time I&apos;d achieved the upper helm station, he was already well away from the fuel dock, squeezing the Explorer out between the inner and outer breakwalls, heading for Government Cut and the open sea. While casually working the destroyer-type wheel from a Stidd seat with a single bare foot, he modestly attributed the maneuverability I marveled at to a single factor: "Thrusters," he grinned, extending a huge, workman-like hand in greeting. Marlow&apos;s appearance was salty. Tall, lean, and dressed in faded jeans, a blue knit shirt, and a baseball cap emblazoned with the Marlow Explorer logo, he looked like a diesel-powered version of Tristan Jones. As we headed offshore, a thumbnail sketch of his life emerged. Born one of 14 children at "Eleven Mile" oyster camp near Apalachicola, Florida, he&apos;d gone to sea as a kid, working his way around the world on tramp freighters. After a brief, unsatisfying skirmish with law school, he fetched up in the recreational marine biz, a livelihood he&apos;s pursued with gusto and a fair amount of success ever since. "My wife says it takes a woman to get most men&apos;s attention," he concluded, "but with me it takes a boat!" After I took the wheel, the Explorer ran with unruffled ease in the open Atlantic, as if the four- to six-foot combers that prevailed there simply didn&apos;t exist. Visibility was great, all the way around. 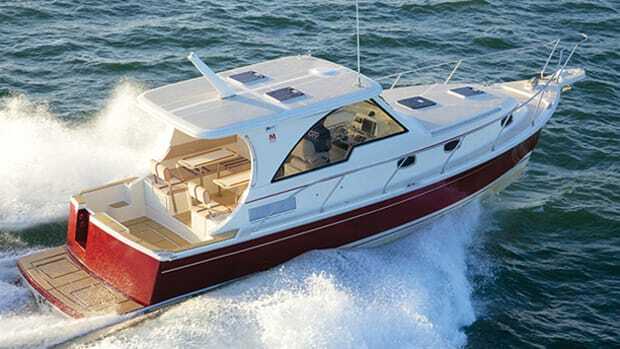 The ride was smooth and dry and the steering responsive, thanks both to Hynautic hydraulics, a gutsy power-assist system that boasts two big engine-drive pumps (one on each main), and a special effort-multiplying device that accelerates rudder response when the steering wheel is rapidly turned. Average speeds I recorded were respectable, despite the fact that our props were underpitched and our engines registered only 92-percent load at wide-open throttle, a condition reflected in our modest fuel-burn numbers. "I hate lugging a diesel down," Marlow explained. 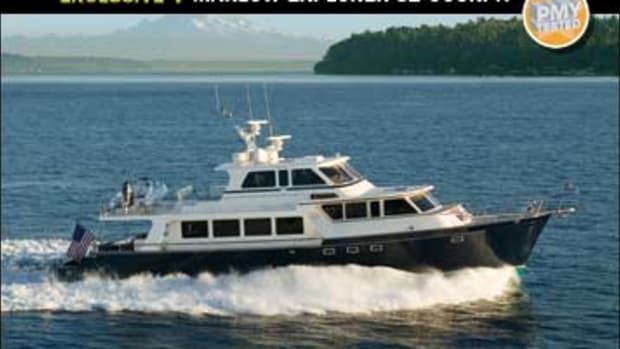 Going down-sea was the real highlight of the sea trial, however—yaw (the side-to-side slewing so typical of most vessels with broad, flat transoms like the Explorer&apos;s) was virtually absent. 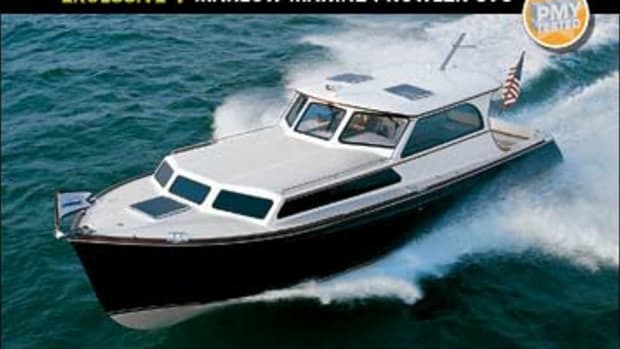 Marlow credited this phenomenon to a patented, hydrodynamically shape pair of molded-in skegs that run the length of the vessel&apos;s propeller pockets—Velocijet Strut Keels, he calls them. Not only do they consolidate turbulence-inducing aspects of the running gear into fish-slippery protective housings (with big bearings lubricated by engine-waste water), they also augment directional stability, particularly in following seas. Joinery: Marlow travels to Cambodia, Thailand, and other parts of the world to buy his own logs, then has them sawn to his own specifications for use in his boatbuilding facility in China. Thus he&apos;s able to offer a fine, attractively priced selection of woodworking raw materials, in addition to the craftsmanship Far Eastern artisans are justly famed for. Our test boat&apos;s saloon sole, for example, was comprised of solid, unbroken, 5?8-inch teak planks, each 21 feet long and perfectly fitted to adjoining strips of solid ebony. 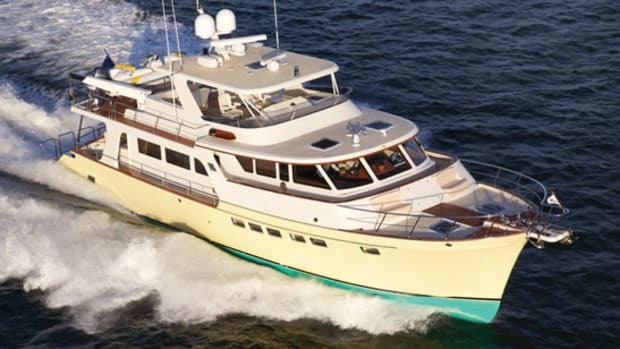 Accommodation spaces: Thanks to the strength of vacuum-bagged, composite-sandwich laminates, the Explorer&apos;s bulkheads, decks, and soles require no wooden framing for support. Marlow estimates he thereby eliminates enough structural wood from the Explorer to fill an entire 8&apos;x8&apos;x20&apos; ocean container. The results were obvious. 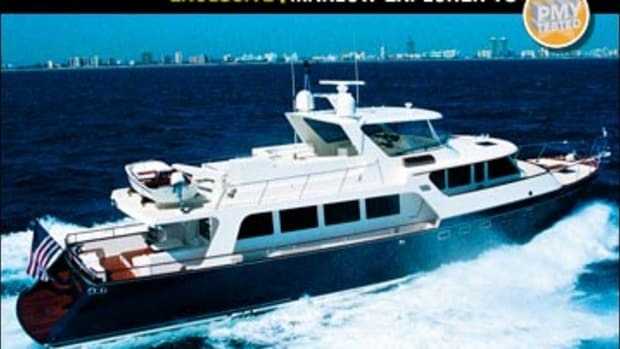 Our test boat&apos;s full-beam master was vast, the other three staterooms onboard (VIP forward, guest to port, and crew&apos;s quarters aft) were all sizeable, and the saloon/galley/dinette/dining area on the 0-1 (main) deck was darn near ample enough to produce echoes! Drinking water: The Explorer&apos;s Racor-filtered water supply is segregated into three 304-grade stainless steel tanks; an interconnected pair with a 400-gallon capacity for sinks, washers, showers, etc. ; and a third 100-gallon tank for drinking water and ice makers alone. The latter tank is polished to a high gloss inside to nix potential taste problems. Construction: Just three incredibly complex molds are used to manufacture the Explorer. Portlights, fuel fills, windows, doors, and most other openings and structures are incorporated into them. This increases strength and watertightness by reducing the number of seams. It also ultimately speeds and simplifies the manufacturing process and produces a high-quality finish. Engineering: Every hose, pipe, and wire onboard bears a color-coded phenolic label. Northern Lights gensets are ensconced in sound boxes with water pumps viewable through special lexan portlights. There are mirrors outboard of the mains to keep tabs on leaks. A sea chest supplies clean water to all systems, thus eliminating numerous through-hulls and plumbing runs. Thick layers of insulation in the engine room—two inches of Corecell foam, under two inches of Soundown foam, under one inch of rockwool—keep sound levels low. When Marlow and I finished our tour late in the afternoon, we were both physically exhausted—it had been a fun day, but a very long one. 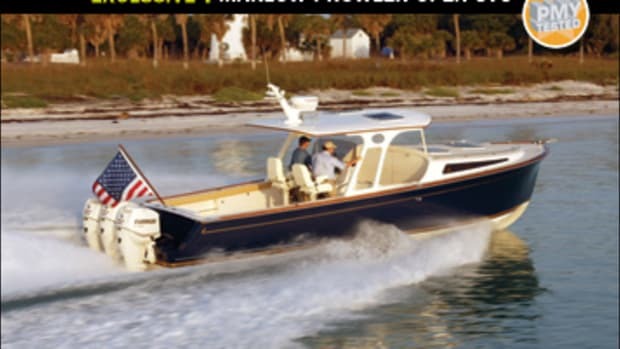 When he casually said, "Well, guess I&apos;ll be headin&apos; back home, Bill" (meaning to his boatyard/dealership in Snead Island, a few miles from Sarasota), I was frankly amazed, given the lateness of the hour, the distance entailed, and the navigational niceties of rounding the tip of Florida in the dark. I came to accept the idea, though. 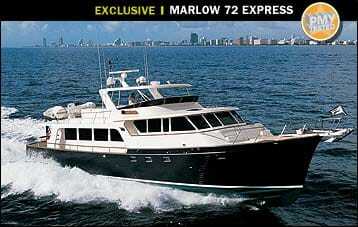 The Marlow Explorer 72&apos;s a stalwart, sure-footed passagemaker. And so, without a doubt, is the guy who built her.